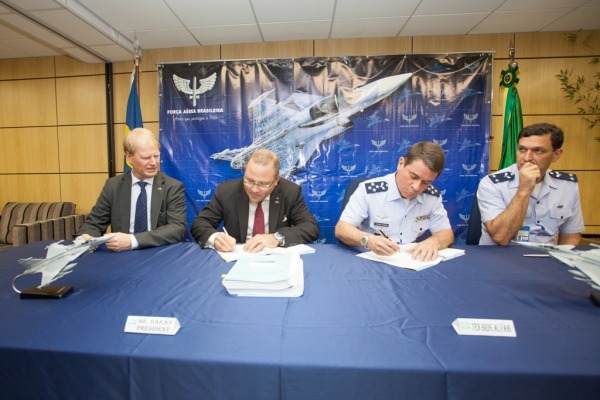 Saab and the Brazilian Airforce sign the $5.4 billion contract. Photo by the Brazilian Airforce. Hours after President Dilma Rousseff was reelected in Brazil, Saab announced that the $5.4 billion contract for selling 36 Gripen NG fighters to the Brazilian Air Force has been signed. It is currently one of the most valuable defense contracts negotiated in an emerging market. The conclusion of the deal is a turn point for Brazilian industry, Saab and for the new Swedish Prime Minister Stefan Löfven. After a week of strengthening due to the suspected submarine, the Saab stock now continues rising due to the closing of the contract with Brazil. Since the suspected submarine was first spotted October 17th until today when the Brazilian contract was confirmed, the stock has increased with 10 percent. The contract requires that 80 percent of the Gripen fighters are constructed on Brazilian soil. Igniting the aerospace industry is exactly what President Dilma needs in a Brazil where increasing inflation, stagnation and diminishing investments are a fact. Brazil joins Sweden in becoming the launch customer for the next-generation Gripen. Photo by Saab. “We will transfer technology and the capacity to project and construct fighters” Håkan Buskhe, President of Saab affirms. The Brazilian company Embraer will lead the local fabrication of the planes but other Brazilian companies will also participate, such as AEL, Akaer, Atech and SBTA. The development and production of Gripen NG will generate thousands of employments directly and indirectly in Brazil. “This will be a leap, not only for Embraer, but for our industry as a whole”, declares Lieutenant General Alvani Adão da Silva, Director of the Department of Science and Aerospacial Technology in Brazil. The Southern American giant will participate in the development of the Gripen NG and will be responsible of the version for two pilots. 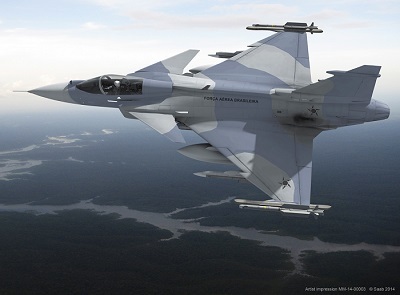 The Brazilian contract includes 28 single-seat and 8 two-seat Gripen NG. The Gripen fighters are to be delivered between 2019 and 2024. This also implies that Brazil will need to rent older Gripen C/D jets from the Swedish Armed Forces before the delivery date to cover defense needs, such as the 2016 Olympics in Rio de Janeiro. Brazil’s Mirage 2000 jets were retired in December of 2013 and currently the even older F-5EM are being used. This deal is of importance to the country of Sweden that recently declared that it will buy 60 new Saab Gripen jets. With the Brazilian contract the costs for developing the plane will drop since they will be split between the two countries. “The real financial winner in this case is Sweden. Saab, of course, as well but primarily Sweden and the Swedish Defense. I cannot say exactly how much money the Swedish state will earn with the deal because of secrecy of the contract. However, I can say that it’s a considerable amount of money due to the division of costs and development”, says Saab’s President Håkan Buskhe. I have personally, in confidential discussions with another Swedish Minister, been made aware that there are plans of broadening the Brazilian-Swedish collaboration. These intentions involve other areas of cooperation than the industry market. The aim is to increase a cultural and social interchange, beyond the commercial relation. Sweden and Brazil have a long history of successful industrial cooperation and history might just intensify the cooperation in the future. 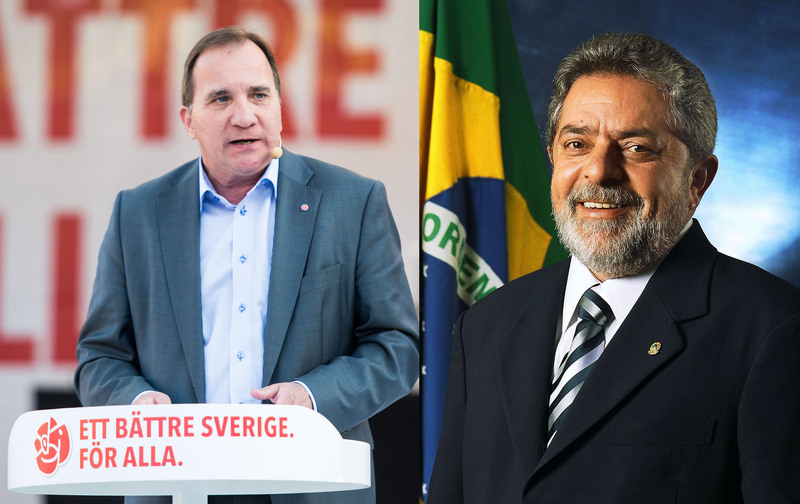 The new Swedish Prime Minister Stefen Löfven is an old friend of the creator of the Brazilian Worker’s Party, ex-President Luiz Inacio Lula da Silva. Both were welders before becoming active labor unionists and after years of struggle both reached the posts as Presidents of the Steel Worker’s Union in their respective countries. During a visit to Sweden Lula even slept at Löfven’s couch. Swedish Prime Minister Stefan Löfven and Brazil’s ex-President Luiz Inácio Lula da Silva. Photos by Mattias Vespä and Ricardo Stuckert. “We cannot live on conflict, we have to try to find solutions as well. Going about and fighting others is not my thing.” Comments as such have so far established Löfven as a “nice” politician, unable to beat his rival to the post as Prime Minister, Fredrik Reinfeldt, in debates before the elections. On the other hand he stirred up quite a conflict declaring that Sweden will recognize Palestine as a state. Löfven is now the leader of one of the weakest minority governments in Swedish history with merely 40 percent of the seats in the parliament. Therefore it would be wise to take this opportunity and develop a strong collaboration with Brazil, built on former contacts and cooperation. With the right media strategy Löfven could become an equivalent to Lula in Sweden, maybe not the sharpest politician but by building strategic business alliances the economy will grow and the people’s love will flourish as a consequence. Buskhe has not commented the fact that Brazil and Argentina have signed a contract where Argentina says it intends to buy Gripen from Brazil. However, with the Brazilians buying Gripen the fighter’s future is secured until 2050. Regardless of Argentina’s next move, the Brazilian deal increases the possibilities of further exports. The competition on the fighter market is heavy but Saab is now certain that it will continue in the fight of developing next generation’s fighters. Do you want me to write a story for you on this topic or something else? This entry was posted in Argentina, Blog, Brazil, Defence Industry, Dilma Rousseff, Gripen, Luiz Inácio “Lula” da Silva, Politics, Saab on 27th October 2014 by Cecilia Vaccari. If you have an interesting story worth to be told or if you have a tip about something that should be told, let me know. Fear of Venezuela or the US? Copyright © 2019 CECILIA VACCARI. Twenty Twelve child theme by Maria Dahlberg Montenegro.